Virginia’s Nancy Boys | Virginia Right! It is becoming quite amusing watching Virginia’s Nancy Boys Tom Perriello, Gerry Connolly, James Moran and Glenn Nye try to run from the far left fringe of the likes of Speaker Nancy Pelosi. It takes a special kind of person to vote with a Speaker that believes unemployment is the fastest way to create jobs. Talk about shucking and jiving. Glenn Nye was the only Virginia Democrat to vote against the Obamacare bill, but don’t think for one minute this lets him off the hook for the rest of his votes to “spread the wealth”. Nye happens to be in a conservative area and knows the people of the district were overwhelmingly against this government takeover of health care. This one vote does not make Nye responsive, it makes him dishonest. His vote was cast against Obamacare not because it was the will of the people and the right thing to do, but in hopes of being reelected, so he can continue supporting the Progressive agenda. This is a rundown of the for Nancy Boys that Virginia needs to send back home. 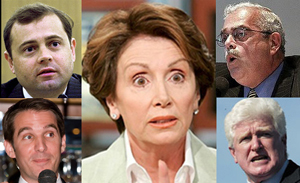 Gerry Connolly – Votes with Nancy Pelosi 97% of the time. Democratic political leaders despite the wishes of his constituents to the contrary,” Fimian said. In just his first term, Perriello voted for government-run healthcare legislation that will cut Medicare by $500 billion and drive our country further into debt. Tom Perriello voted for a national energy tax that would kill small businesses and bankrupt the Fifth District in terms of what we so desperately need right now – jobs. We can’t afford two more years of Tom Perriello. In virtually every instance, Perriello has ignored the interests of his 5th District constituents in order to serve the agendas of Nancy Pelosi and Democrats in Washington. Scott Rigell, Republican candidate in Virginia’s Second Congressional District, called on Democratic freshman incumbent Congressman Glenn Nye to return the campaign contributions he has received from disgraced former House Ways and Means Committee Chairman Charlie Rangel (D-New York). Congressman Rangel is being investigated by the House ethics committee for a wide range of alleged ethical violations, including failing to report on required federal disclosure forms several hundred thousand dollars of income, failing to pay taxes on a vacation home in the Dominican Republic, misuse of a New York City rent-controlled apartment for political purposes, and violating House rules when traveling to a Caribbean vacation conference in 2007 and 2008. Rangel has already been formally admonished by the House ethics committee for violating ethical rules related to the receipt of gifts. Earlier this week, he temporarily stepped aside as Chairman of the House Ways and Means Committee until the ethics investigation concludes. With Virginia congressman Jim Moran’s recent complaints that Jews are pushing America into war with Iraq, House Democrats appear to have found their replacement for their previous King of Controversy, Jim Traficant (who is currently serving an eight-year prison term for bribery, racketeering, and income-tax evasion). Moran quickly apologized, although — as Ramesh Ponnuru has pointed out — whether the congressman has bias in his heart is less important than the fact that in his worldview, Jewish Americans alone can determine America’s choice between war and peace.